Reading Room Cliffs Notes is the essential guide to what's going on in the Reading Room. "Flashback" captures a highlight from last week, while "Foreshadowing" gives a full list of the upcoming week's events. Make a visit to the Bryant Park Reading Room presented by HSBC a plot point in your week! The Bryant Park Reading Room kicked-off the Word for Word Saturday kids program with everyone's favorite third grade teacher, Ms. Frizzle. 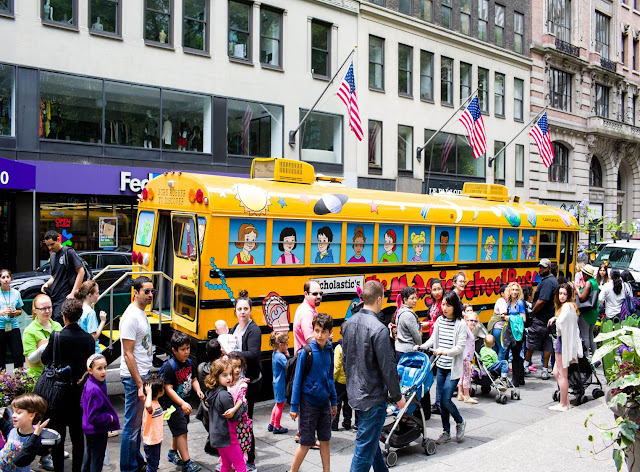 After a reading lesson, Ms. Frizzle took the kids aboard The Magic School Bus, where they were able to interact with various hands-on science exhibits. Book Club discussion on Ulysses by James Joyce. Facilitated by Larry Kiwarn, writer and lead singer of the Irish rock band Black 47. Stop by and pick up a free advanced copy of your book club choice while supply lasts. Daniel Wolff, Gregory Pardlo, Elizabeth Gray and Andrea Cohen read their original work. Real Characters returns with another amazing lineup of New York’s best and funniest authors and storytellers. The first person to say "Real Characters" to the Reading Room Coordinator at the event will win a free copy of the book. Hosted by Bobby Rivers, Actor & Radio Personality. World-renowned bestselling author Jackie Collins discusses her classic family saga filled with love, lust, and revenge. The first person to say "The Santangelos" to the Reading Room Coordinator at the event will win a free copy of the book.